MAKE YOUR OWN WORKING BELL USING ELECTROMAGNET AND OTHER ACTIVITY. 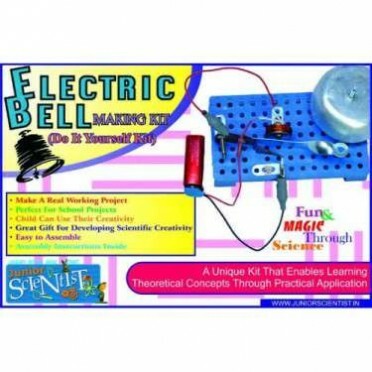 Features : An effective way to help children learn the basic properties of an electric bell is through a practical science project that teaches them how the bell works and why?? A magic view of magnets. On the surface of water magnets make different shapes of geometry, like t.. The project shows how change in Direction is sensed by pilot of aircraft. (AGE GROUP 14 TO 17 YEARS..
Do it Yourself kit is to construct your own Windmill.To demonstrate the conversion of ..
Impress your kids and create your very own eruptions with this volcano experimentAge Group : 8 ..